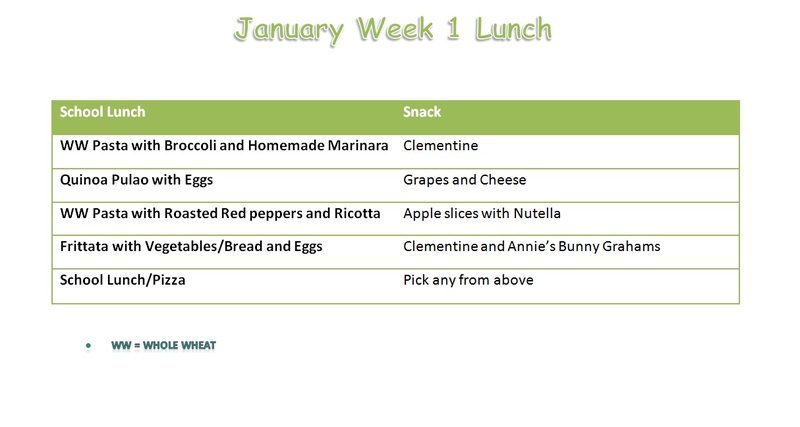 It is week #4 of packing lunch but I am posting Lunch for Week #3. And I can feel the weariness in my bones. Some days I feel like just giving it all up and let the kids eat cafeteria food. And trust me, I would have done it if they would agree to eat food at the cafeteria every day. Last year, Little Sis was very excited to buy her lunch at the school cafeteria. I wasn't ready. But after much persuasion I gave in and signed her up, putting money in her lunch account. LS's excitement was palpable and you would think she was going to eat at a Zagat rated restaurant instead of the school cafeteria. She scanned the menu for hours and picked a day when she thought that the lunch would be to her liking. The school lunch menu has a pretty balanced offering although I have never seen the school lunch with my own eyes and would really want to see if the lofty menu translates to a healthy meal in reality. I mean what if they are saying Whole wheat Mac and cheese on paper and are actually opening up a box of Kraft Mac 'n' Cheese. None of my kids' schools allow parents in the cafeteria during lunch so I guess I will never know. So anyway slowly I found LS's interest in cafeteria food had started waning. She didn't scan the school menu with as much zeal as before. I realized she likes the independence of picking her own lunch at the school cafeteria but the food not so much. Ah well! Big Sis's middle school has a really good cafeteria from what I hear. However BigSis is not much of a meat eater and does not like cold-cut sandwiches or tuna sandwiches or egg salad sandwiches or burgers. So her choice at the cafeteria becomes very limited. Most of her friends pack a big lunch from home too and so she prefers lunch from home to eating at the school cafeteria. A home-cooked lunch is not that difficult with little planning of course.The fact that there is a fall back option of the cafeteria does bring some peace too. This was a 4-day week and I had to do only a 3 day lunch plan. Some of the stuff that I packed for the kids this week, also doubles up as dinner. What did you pack in your kid's school lunch box ? This is a great and easy dish to make with ground chicken and Taco Seasoning. 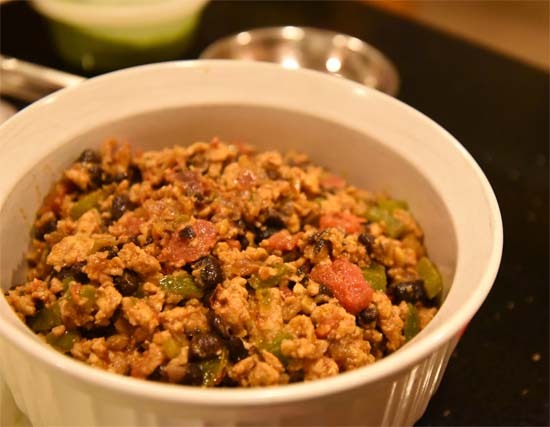 A big bowl of Keema/Black Bean can be made ahead and used during the week any which way. Add about half of an onion finely chopped. Add a good amount of taco seasoning and fry the tomatoes for few minutes. I use Trader Joe's Taco seasoning which is amazingly good. If you don't have taco seasoning, a mix of cumin powder and garam masala powder should do the trick. Add the keema(1 lb) to above. Stir to break any lumps and cook till the meat is not raw. The ground meat will release some water and you have to keep stirring till the water has totally dried up. 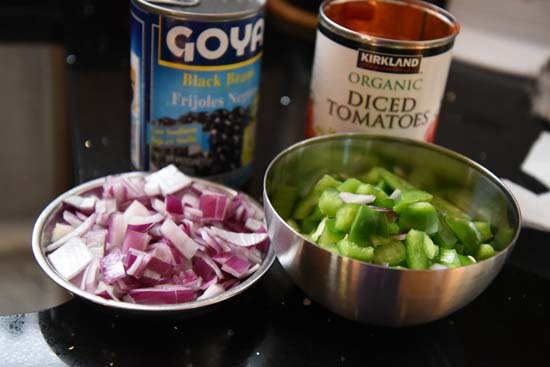 Add salt and add a can of drained black beans(7 oz can). Drain the black beans and then add. Fry for a few more minutes. Add some more taco seasoning if you wish. The resulting dish has to be dry with no gravy so make sure that it is moist but dry. Once the keema is cooked and you are happy with the way it tastes, you can either eat it or make these quesadillas for lunch. 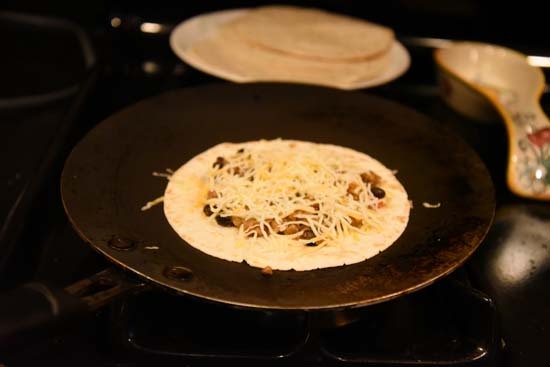 To make the Quesadillas use Flour Tortillas or home made rotis. First toast/warm the already cooked roti or Tortialla. Put a cooked roti/tortilla on a Tawa or griddle. Cook both sides until warm and keep aside. Do same with the second Roti/Tortilla. Now place the warm roti/tortilla on the tawa and put the keema on the open face of the tortilla. Sprinkle shredded cheese on it. At low heat, place the other tortilla/roti on this one and press gently until the cheese melts. Carefully flip it all together and cook the other side for couple of seconds. Let it cool a little and then cut in halves or quarters. Oven roasted Tomato Soup with Bread -- This is a great soup for anytime. I make it a little spicy but my kids like it that way. I add peppers to roast along with tomatoes for this soup if I have them. You can make a big batch of this and it will be good for two meals. 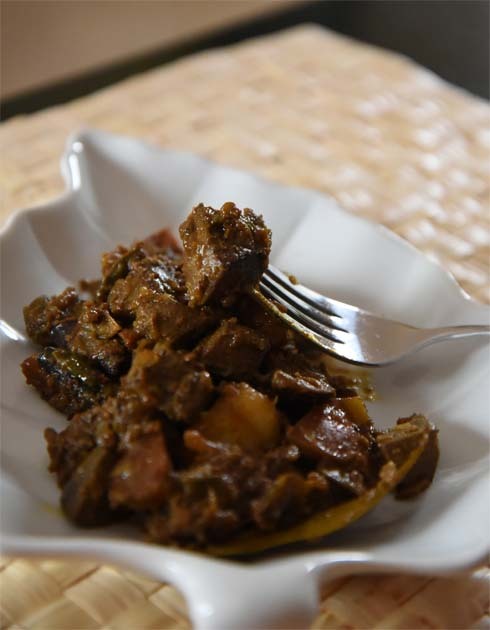 I don't know about you but I simple love goat liver aka "mete" in Bengali. Chicken liver -- not so much but Goat liver -- yum! My daughters freak out at the very idea that I am eating innards of an animal and refuse to even taste it. Having been fond of mete since a wee young child, I don't understand their reaction. While "mete" was always thrown in when one bought goat meat back in the days, now I hear it has to be bought separately. The middle-eastern butcher shop where we get our meat does not always have liver available either but he obliges us on special requests. But then my daughters will not eat it so only rarely do we make a mete chorchori these days. 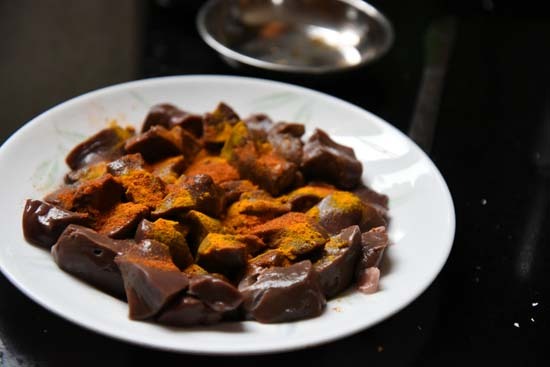 Now though I love mete, it is the husband-man who makes a mean mete charchari, a dry goat liver dish with spices and potatoes. He would make it often when I was pregnant with Big Sis and had a condition that made me anemic. Among the various food that were suggested to boost up my iron and RBC, were beets, spinach and goat liver. I naturally preferred the goat liver. I mean come on, who wouldn't eat "mete charchari" when the doctor prescribes it in not-so-many-words? However he refuses to give out a set recipe. So I took pictures to wing it later. 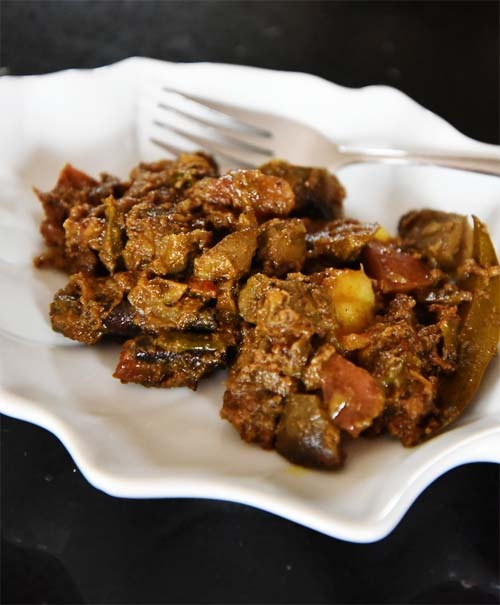 Though we prefer goat liver and make this only with goat liver, you can follow the same recipe for chicken liver. I find chicken liver needs more spices than goat liver, so adjust spices according to your taste. Our butcher chops up the liver in small pieces so all we have to do when we get it home is wash well. and leave aside for 30 mins. Add the potatoes. With a sprinkle of turmeric powder, fry the potatoes until they get golden brown spots. Remove and keep aside to add later. When the spices pop add the green chilies and onion. Fry until onion is brown and soft. Next goes in the tomatoes, 1 tsp garlic paste and 1 tsp of ginger paste. Keep frying until the tomatoes are all mushed up and the raw smell is gone. Now add the goat liver pieces and fry the liver at medium-high heat. You might need to sprinkle water in-between if you see the spices charring. Continue frying. This step is called koshano and will take some time until you see the liver pieces changing color to a deep brown. Add the fried potato cubes and mix well. Add 1/4th tsp of Garam Masala powder and give a good stir. Now add very little water and cover and cook. Cook until potatoes and liver is done. It tastes best with ruti or parota. And of course rice. 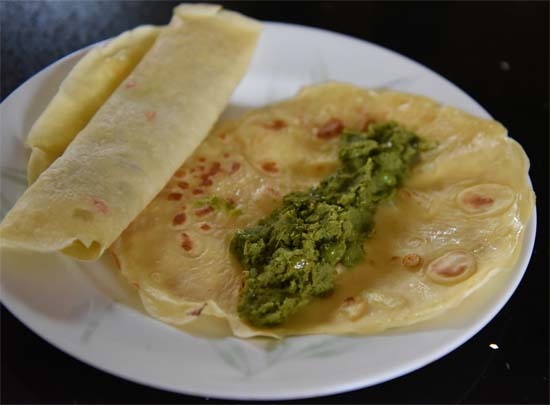 Savory Crepes is what my mother called Dim er Parota. I mean she didn't know what savory crepe was. She just made Dim er Parota and it was fantastic. Once I knew what crepe was I started making the savory version like my Mother with onion and green chilies in the batter or the version without them which could be slathered with something sweet like Nutella. It all starts with one single batter. For sweet crepes skip the onion and chili. Add a little sugar to the batter and maybe a few drops of vanilla. Cook for a minute or until you see the edges turning golden curling up. By now it should be easy to slid a spatula under it. Flip and cook the other side for 1 more minute. You will see a few brown spots on the surface. 1. A green pea stuffing like the Koraishuti Kochuri stuffing is great. For sweet crepes, slather the inside with nutella and roll the crepe. Organic Spinach and Cheese Ravioli from Costco -- This is a big favorite with both my girls and it indeed tastes very good. I cook it according to package directions. Then heat some olive oil in a pan. Add the marinara sauce. Gently add the cooked ravioli in a single layer. Cook for 2-3 minutes until the raviolis are lightly golden on both sides. Next day heat and pack in a thermos. So, the holidays are over and we are all back to routine tomorrow. January and February are the coldest months here and with all the glitz and the glamour of festivals that start from October being over, the start of the year looks kind of bleak. A new project, new resolutions seems to be necessary to push through these two months until Spring arrives and we can dump the resolutions and go back to having fun. The last few weeks have particularly been a whirlwind with me. I went on my first solo trip to India for a cousin's wedding and though it was only for a week (or 9 days as Little Sis will correct me), there was a lot of guilt and emotions tied to traveling sans the kids. I thought someone would be miserable (me or them) but it turned out to be good though. The girls managed fine with their Dad and friends while I had a great time at the wedding with my parents. I was back just before Christmas to wrap gifts to put under the tree and welcome friends over for the Christmas break. Mostly the husband-man did the cooking but I did make a date-apple cake, chicken roast and butternut squash soup for the Christmas dinner. This was followed by Dilwale, night long adda and more friends. Then there was the New Year's eve party at my friend's place with great company. New Year's Day was welcomed with Koraishutir Kochuri, Aloor Tarkari and another friend. The finale to the holidays was watching Rockettes at Radio City Music Hall. Mesmerizing show and the experience will help us survive school tomorrow. There has been a lot of binge eating the last couple of months and we are trying to get back to more simple homecooked meals. There is nothing that keeps you fit like a home made meal even if it is nothing but plain dal-rice. Dal and rice is not a favored option when packed for school lunch though so we have to get creative there. These can double up as dinner the night before or the same day. Since I am not great at rolling parathas or rotis, you won't be seeing much of those here. The lunch that I pack are all made the night before and warmed and packed in the morning. 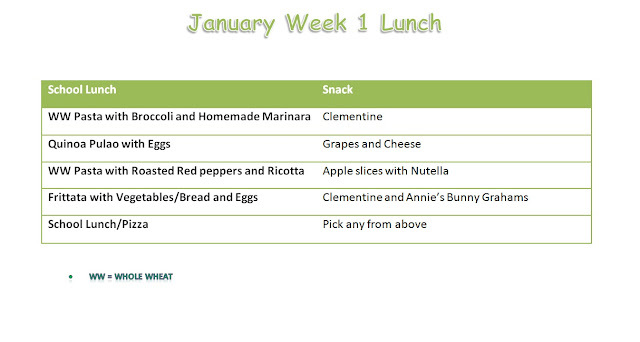 Also one day a week, the girls get to pick school lunch and that depends on the menu provided by the school. Finally, take this as a base and create your own depending on what dishes are preferred at your home. Be creative. And have a meal cooked at Home. It is not that difficult. Homemade Marinara Sauce and Pasta -- Make marinara sauce according to the recipe. Then follow the pasta recipe in the same post. To make pasta with Broccoli, boil the broccoli florets separately and add the broccoli instead of the vegetables suggested in that recipe.The marinara sauce stays and can be used for another pasta dish the same week. Need to Buy -- Organic Canned Tomatoes(Costco has good ones). Good Quality Roma Tomatoes.Basil. Garlic. Olive Oil. Whole Wheat Pasta. Broccoli. 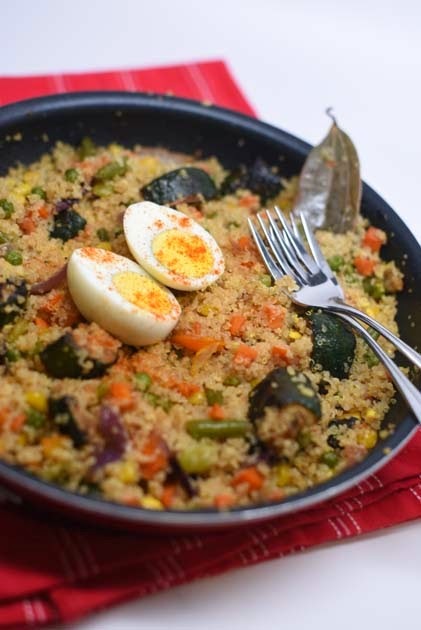 Quinoa Pulao -- I love Quinoa and though it is not a coveted lunch box item with my kids I do pack it once in a while. Big Sis will eat the pulao made according to this recipe though she is not a fan. Little Sis might not eat it and she will get a regular pulao instead. Add eggs or sausage or meatballs or paneer. Need to Buy -- Quinoa, Vegetables like carrot/cauliflower/green beans or a pack of frozen vegetables. You can be creative with the spices but some Garam Masala or Biryani Masala is a great addition. Pasta with Roasted peppers and Ricotta -- Don't get hung on the ricotta for this one. If you have ricotta great. 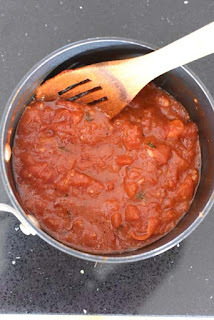 Otherwise just use roasted red peppers and spinach and follow recipe for pasta with Marinara. You already have the marinara sauce so why not? 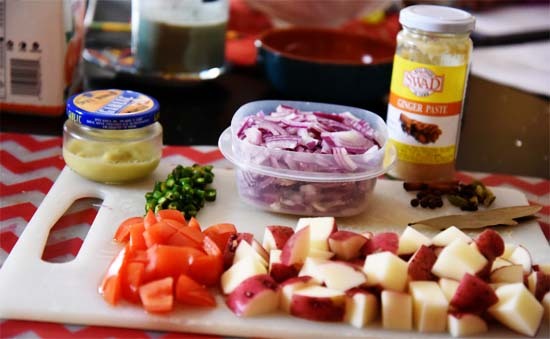 Frittata with Vegetables -- This can be made with any vegetable on hand and is super easy to make. I will make it the night before, and then warm and pack the next morning. If you have a thermos lunch box, you can cut in squares and put it in the thermos. 1. This is a good season to eat Clementines. I love the cute tiny clementines from Halos and two of those make a great snack. 3. Annie's Bunny Graham crackers from Costco are for snack this month so a pack of that will be added off and on. 4. Grapes and Cheese is another favorite snack which both my girls would prefer to have after school. Pepper Jack, Gouda or Manchiago are loved at our home.